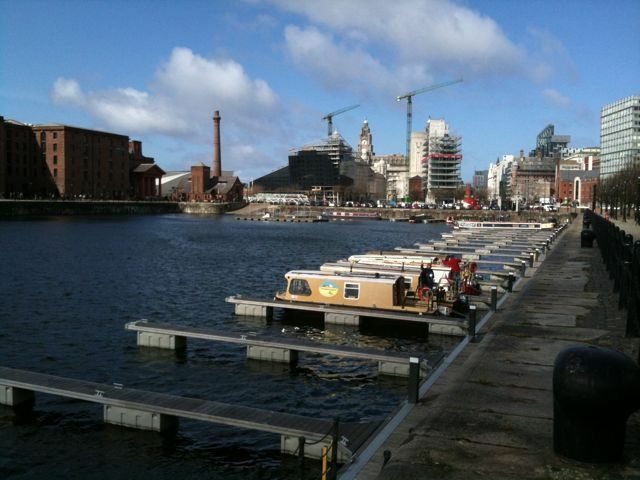 At lunchtime on Easter Sunday five WBOC boats entered their designated berths in Salthouse dock next to the famous Albert Dock in Liverpool. It is thought these are the first Wilderness boats to have completed this passage. The five boats were Tophyl, Snapdragon, Sloe, Arwyn and Bobbles. The visit was the successful culmination of much negotiation with BW over the use of 30 day Explorer licences on this passage and allowing “trail boats” to pass through the docks. 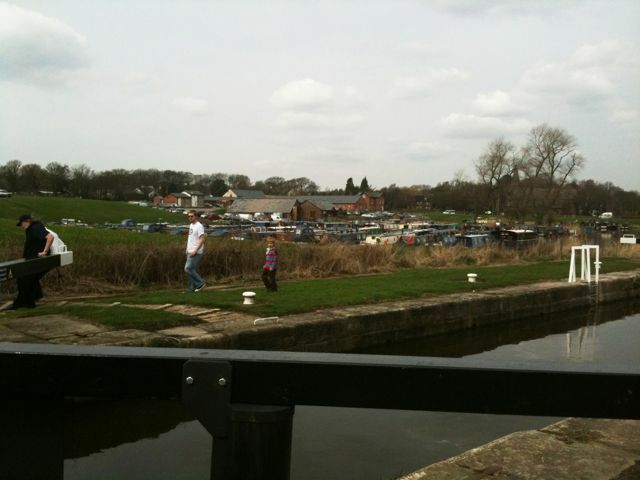 All had arrived on Maunday Thursday at the new St Mary’s marina near Rufford on the Rufford arm of the Leeds and Liverpool canal. Sloe and Snapdragon launched when they arrived but the others, who arrived after dark, stayed in “caravan” mode until they launched first thing on Good Friday morning. Leaving late morning on a cold and blustery day, they cruised down over two days to wait for BW passage into Liverpool at bridge 9 near the famous canal turn of the Aintree racecourse. 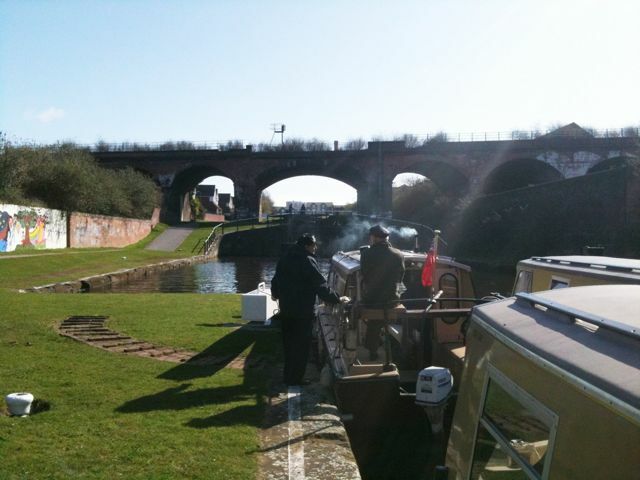 The weather on the second day was much better, so much so that the crews enjoyed a drink and nibbles at lunchtime on the towpath in bright sunshine in beautiful Lancashire countryside with the North Wales snow covered mountains in the distance. 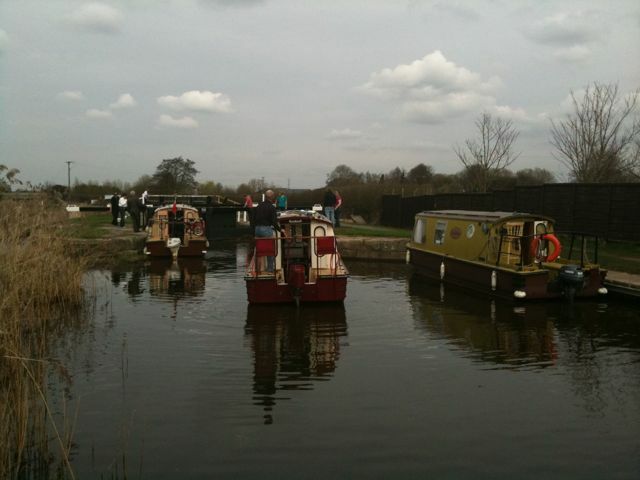 At 8am on Easter Sunday the BW crew arrived and the Wilderness floatilla along with two narrowboats passed through the first of two BW manned swingbridges. The passage was uneventful except for the odd plastic bag around a prop, although passage was through and past loads of plastic bottles and many footballs caught in the reeds. It seemed sad to see the waterfowl trying to build nests, lay eggs and raise their young amongst so much human rubbish so thoughtlessly cast aside. Halfway along the group made use of the BW sanitary and water facilities near a brand new Tesco supermarket, which also had petrol. But both were shut as it was Easter Sunday. No easy way was found through to reach them though, had they been open, except perhaps over the fence! Arriving at the locks the group were split with Tophyl and Snapdragon working down with a converted 1935 butty called Pavo. On reaching the bottom lock, passage out was under a low brick arch and an even lower cast iron arch that necessitated the removal of chimneys. This was the start of the journey through the docks. First we past the largest brick built bonded warehouse (at the time it was built) and then out into a windy and choppy dock which gave fantastic views of the Mersey and the new wind generators that power the new docks. Then a left through a dock into a new cut towards the newly converted warehouses and new hotels and apartments. On through a new lock which we operated and through the new Liverpool Canal Link cut and tunnels by the pier head and the “three graces”. On to the last lock that BW had to operate which allowed access to the Canning Dock, Canning Half Tide Dock and into the Albert Dock. 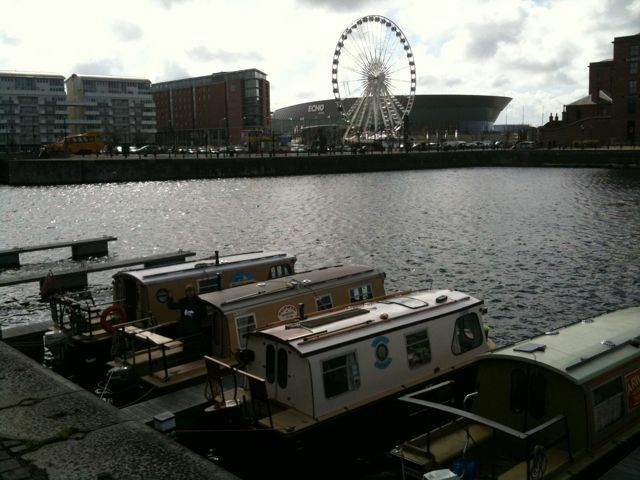 Then out into Salthouse Dock to find our berths right in the middle of the city. With so many attractions around the three and a half days we had ahead rapidly passed. The docks were busy in the day with the yellow “DUCKS” or really “DUKWs” taking visitors for trips around the city by road and then for trips around the docks by water. Other boat trips were available. The Beatles exhibition in the Albert dock complex was good value. Especially as we booked as a group of ten. Ask us more what actually happened when you meet us sometime. 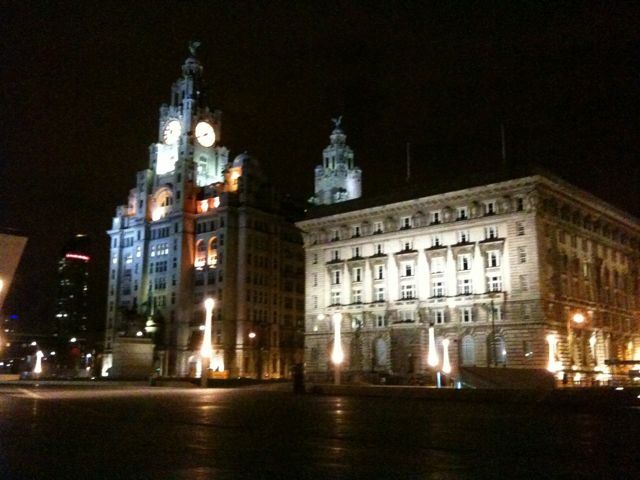 Other visits were made to cathedrals and to shops, to restauraunts and trips on a ferry cross the Mersey. The trip back started at around 9.30am following a visit by the BW staff who had helped us to book the passage and who had come down especially from Wigan to see what our boats were all about. The day was sunny and the breeze lighter and warmer than that on the inward trip. With the two narrowboats travelling out first together, we managed to show we could get the four Beavers and one Otter into one lock all the way to the top of the flight. The trip out was uneventful and we left the final bridge (9) that was controlled by the BW crew at around 2pm. We continued on out into the countryside for a night time stopover near bridge 21. The following day Arwin was going on towards Wigan whilst the rest returned to the Rufford branch and went to look at the sea lock and then returned to Rufford. Bobbles pulled out straight away whilst the other three were joined by Arwyn and went for a very nice meal in a local pub, opposite a small fuel station which also sells groceries and papers. On Saturday morning we left Arwyn to explore the rest of the branch whilst we went to recover our boats. The slipway proved easy to use and hubs didn’t get wet. Then as it was warm and sunny, we enjoyed a very nice lunch on the terrace in front of the Brasserie before leaving for home. The trip which was well organised and suggested by John Parker, was a great success to this busy and interesting city. It’s well worth a visit as there is lots to see and do. PS As a final note this article was mainly composed and posted from the free iPhone WordPress App whilst in Liverpool and pictures were inserted having been taken on the 3GS iPhone camera. I was impressed!